Sourcing tradition and quality when it comes to food is a very easy task when in Meath County Ireland! Meet Peter Whelan, of The Whole Hogg Farm, located near Slane Ireland. Peter and his wife Susan began raising the ancient breed of Irish Grazer pigs, aka Tamworth pigs seven years ago and has since brought traditional Irish pork products to a new level with a faithful following of neighbors and market goers. An artisan butcher, Peter is preserving the traditions expected at the Irish table while creatively offering new flavor and products. He is passionate about the care of his herd, the high quality of his pork products and the satisfaction of his loyal customer base. Recently I traveled with him to the Honest2Goodness Farmer’s Market in Glasnevin Ireland, near Dublin, and it was quickly obvious how sought after his pork is. Within minutes of the market opening his black and white puddings were sold out and by the end of the day the case was completely empty (well except for the few delicious samples he graciously was holding for me to enjoy at home!!) His selection that day was outstanding and impressive with handmade puddings, mounds of sausages in various flavors from sea salt & leek to garlic & chive to sundried tomato & cracked pepper. Peter’s “rashers” were one of the must haves for every shopper. the irish rasher is the bacon of the Irish Breakfast plate. So much more than bacon, its cut from the loin with a small delicious strip of fat, cold cured and delicious!!! A very lean cut i’m going to guesstimate that it’s just a wee bit healthier for you than my american “streaky” bacon!…maybe?? Peter also provides an amazing assortment of local game including venison, quail, pigeon breasts, whole pheasants, and rabbit. Peter is very aware of his customer’s likes and desires, watching food trends and always cultivating new flavors of thought. He is currently developing a new line of salamis in a more Italian style but still remaining true to that Irish palette. Peter and his pork are the epitome of what is an Irishman: true to tradition that is his foundation yet filled with a creative entrepreneurial spirit to overcome and soar above the tough economical climate hanging over this beautiful country and it’s people. great stuff Cody.theres a film in you and a book. Yep, I think there’s a film, too! 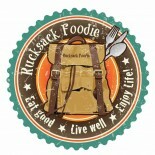 This entry was posted on December 3, 2012 by Rucksack Foodie in FOOD !, Friends, Ireland, Traditions and tagged black pudding, Honest 2Goodness Farmers Market, Peter Whelan, rashers, rucksack foodie, Slane Ireland, the Whole Hogg Farm, white pudding.